I first heard of the term intersectionality from my friend, Diana Fox, an Anthropology Professor who studies and teaches across a variety of subjects including Caribbean culture, feminism, gender and sexuality. The topic came up some time ago after she read a particular blog post of mine which she felt looked at race as simply Black and White, thereby creating a potentially divisive, binary effect. She went on to say that individuals possess many layers of identities, many blends of culture and heritage, and that we must be careful to address the complexities of Black identities, because there is Black Caribbean culture, which in itself can be broken down by island, there is Nigerian culture, and so on. Diana also said that when we look at a person and the many different kinds of identities that make them who they are–women, Black, cis-gender, Jamaican, middle-class—we find some commonalities, or intersections of identification, among some of those points. This recognition of our multiple identities enables us to look at ourselves, and one another, as more whole human beings. Diana was careful to add that our racial, ethnic, and cultural identities are also linked to the varying layers of privilege and oppression each one possesses. She did so, by sharing about the work of Black lawyer, feminist, and scholar on critical race theory, Kimberle Williams Crenshaw, who first coined the term intersectionality, and developed an intersectional theory, in 1989. Diana made it a point to say that our layers of identities and their varying degrees of privilege and oppression are inextricably linked to one another and cannot be separated out. Therefore, if we consider all of this, we can see how looking at race as a singular identity can be problematic. Crenshaw came up with the term intersectionality when trying to find a common metaphor to use to explain to people who couldn’t see how race and gender together played an important role in anti-discrimination cases against employers, like the one filed by a Black woman who believed she was being discriminated against in race and gender when trying to find a job in the auto industry, known to be quite segregated at the time. The court found that discrimination couldn’t be proven because they did hire Black men, though only for the more dangerous, heavy work on the production line, for which they didn’t hire Black women, and they did hire women, though they only hired white women, who worked in the office area. Crenshaw, using the term intersectionality, was able to show that when a race policy is made, and a gender policy is made, and you are Black and a woman, the intersection of those two identities together are bound in multiple oppressions that need to be considered when legal policies are being made and enforced. People finally got it. Another example based on Crenshaw’s intersectional theory is to say we cannot look at feminist issues solely through the lens of gender because the experience and oppression lived by a white woman who is middle-class is not the same as the experiences of multiple oppressions faced by a Black woman who identifies as lesbian, and lower middle-class. The idea is that in acknowledging the complexity of our identities, we can more effectively work to undo the systems of oppression, and right the injustices faced by one’s interfacing identities. When I first heard what Diana said that day about intersectionality, and before processing and learning more about what the term truly meant, and before learning that it was a Black woman scholar who introduced the theory, I admit it didn’t sit completely comfortably with me. It was partly ego and defensiveness and insecurity about whether I could delve into, and think and write about all of this. I thought this must be some intellectual, academic white-people way of looking at things. The construct of race, and its lived implications in this country is always in the forefront of my mind, and what led me to write, and eventually blog, about race. So, despite my self-doubt over whether I could tackle the thoughts swirling around in my head, I felt compelled to both answer my friend’s challenge to consider the theory and practice of intersectionality when fighting inequities. I also felt the need to grapple with the uncomfortability that kept creeping up on me the more I heard the word intersectional being used. Since the Presidential election in November, I have seen the term come up quite often. I have heard many white people admit that they honestly, all of a sudden realized much of what they cared about, was at stake for themselves, and for so many people in this country that didn’t look like them. I’ve seen people who identify as feminists post memes on social media stating, “The Revolution will be intersectional.” I’ve witnessed people opposed to this President’s agenda rallying together to support immigrants’ rights, the environment, the rights of people from the LGBTQ community, people with disabilities, freedom of religion, affordable health care, a women’s right to choose, education, and, yes, to support racial equality, and to say that Black Lives Matter. This should be great news. But, I worry. 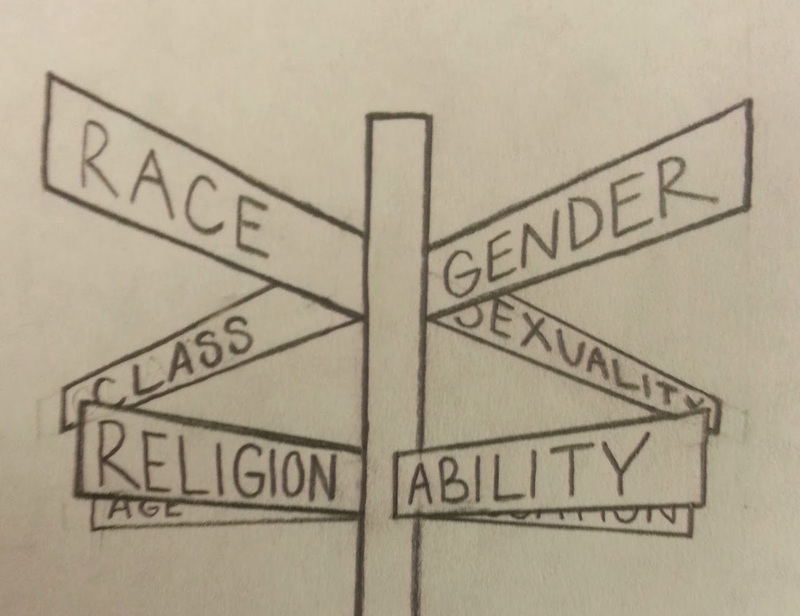 I get that when we consider intersectionality, it can be seen as something that has the ability to bring people from varying backgrounds of race, class, gender, physical abilities, sexual identities, and religions together to fight for a broad range of social, economic and environmental justice matters. I also know that Black people in this country have been put on the back burner for so long, have been pushed down to the bottom of the list, as other previously marginalized groups rise up and receive some of the benefits once only afforded to those with white skin privilege. Intellectually, I know that’s not what is being said. Kimberle Crenshaw and Diana have shown me in their definition and understanding of intersectionality, that it’s very virtue is to not separate out and examine the institutions of oppression separately, and that my seeming desire to highlight race goes counter to the idea of intersectionality’s linking of identities, but I feel it’s important to not only be careful about the language we use, but also about the intentions our language and actions imply. I’ve heard Black people, and writers on race say how they’ve been patient for so long, and how they fear that the matter of white supremacy and racial equality will be forgotten. Not that people of color don’t care about the environment or immigrants’ rights. They do. And not like they don’t care about women’s rights. They do, even though many Black feminists felt excluded from the first few waves of feminism, and spoke out about continuing to feel left out during the swell of today’s movement which championed Hilary Clinton’s presidential campaign. While we fight for what’s right, let’s not put Black people and racial equality behind. In fact, if Hilary Clinton had won the Presidency, we must think long and hard about whether white people would have eased back into complacency. Would we have thought that everything is fine because we had a woman President, and that there wouldn’t be a Muslim ban, or renewed threats for a woman’s right to choose? Knowing we would have continued to fight for equal pay for women, and that marriage equality laws would have stayed intact, would we have then said, all is good, and put down our protest signs? Would we have just moved along with life, gone on our own merry way? At the end of John’s lecture that night, he told the audience that beyond talking about race, we must take concrete actions to solve matters of inequities and injustice, and offered three actions for us to consider taking. He also offered me suggestions on actions we might consider taking when coming together in groups under the guise of intersectionality, to fight for various matters of justice. Aside from worrying about race being sidelined in the fight for multiple groups’ rights, I wish that when white people use the word intersectionality, we don’t use it to jockey ourselves into a position that makes us feel better, or a place where we erase the recognition of the oppression that Black Americans in this country have endured for centuries, but instead use it to acknowledge the needs of each marginalized group….the need to stand side-by-side and fight together so that all in our nation are truly free. Like the photos on social media of white women wearing t-shirts that sport the previously mentioned slogan, “The Revolution Will Be Intersectional,” I also worry that the term is becoming trendy, and its true meaning, lost. I know it is a positive thing to stand in solidarity with one another, and with our intersectional identities, stand together and fight for the rights of all human beings. And, perhaps for me, today’s fight will actually open up my lens of looking at identities beyond the Black and White in America that I write about, while keeping in mind what Alicia Garza, one of the founders of the Black Lives Matter movement tweeted recently, “We’re not all the same. Solidarity isn’t about flattening experiences. Fighting anti-Blackness is the place we can all connect.” I want to also remember what Kimberly Foster, founder and Editor-In-Chief of the online digital community, For Harriet, recently said, “intersectionality is not about identity, but about systems and power.” These are forms of coming together with our intersectional identities I can get behind, and I thank the many teachers here that got me to this place. Also, on this: “whether the travelling of the idea carries with it the capacity to interrogate political practices that are not intersectional.” I think the answer is a resounding Yes, to the confusion of Hillary, Bernie, etc., who got interrogated in a new way in 2016. Well, hi, there, Wendy Jane, and greetings and salutations to you and to you and for you and for your my so, so very For Always absolutely FANTASTIC dearly awesome and awesomely precious soul sisterfriend who you’re For Always so, so very much!!!!! WOW, Wendy Jane, WOW here!!!!! Sister, I just so, so very much love, enjoy, and appreciate this beautiful, absolutely beautiful, straight from your very heart and spirit blog post article here which is very brilliantly composed in such an engaging and outstanding manner with such very masterful composition in the written word, sisterfriend!!!!! WOW!!!!! YAY!!!!! Sister, I so appreciate YOU, Wendy Jane, and also this very lovingly caring and sensitively heartfelt blog post article here created deep down in your heart and with how you worked in such a very diligently conscientious manner striving with all you have with all of your very being to process all of your very thoughts with all of this and to get to the very heart and core of the matter even as you struggled with some of the conflicts which you have with the fascinating term coined by Kimberle Williams Crenshaw of intersectionality, sister!!!!! Sister, I am just so, so very absolutely amazed with our very stupendous Diana Fox’s great thoughts, ideas, and contributions here as well. Sister, I so appreciate your concerns about the very term and concept of intersectionality. I know what you mean here for sure, sisterfriend. I like you do still think that it is very vitally urgent, important, and necessary that all oppressed peoples be considered and that all oppression be ended against all persons and that it is the key here to look at all of the various identities of people juxtaposed to all of their other identities as well as looking at how some persons may be oppressed with some of their identities yet privileged with some of their other identities. Wow, you are so right on here, Wendy Jane, and that figuring out all of this and taking all of these factors into consideration are quite complex matters. Sister, I know what you mean, though, that sometimes black persons are put on the back burner and take a back seat when other oppressed persons and other oppression is taken into account. Wow, Wendy Jane, I so, so very much appreciate YOU, sister, and how you here and as usual as always elsewhere so, so very much love and cherish us so as black persons and have our backs, and how we as black people can count on you like as to how you here have concerns about the very concept and theory of interectionality because you do not want us as blacks excluded and held back as this term is enacted with other oppressed people and other oppression being taken into account first. I thank-YOU, thank-YOU, thank-YOU so, so very much, sister, straight from my very, very heart and from my very, very heart and spirit with all of my very heart from the very bottom of my heart from the very deepest depths of my very heart, my and our sweet sister and friend, Wendy Jane!!!!! I just love how you are very concerned for us as blacks here and that you do not want for us as blacks to be put on the back burner and put in the back seat with our very needs being siphoned off in causes to assist other oppressed people and in eradicating other oppression. Sister, YOU are just the very best and the greatest, my and our absolutely AWESOME Jewish and white sister and friend, Wendy Jane!!!!! YAY for YOU, Wendy Jane!!!!! YAY for this very empowering blog post article here with all of your great efforts in thinking about all of this in your great process in all of this very astutely composing this very fine and excellent writing here, sisterfriend!!!!! WOW!!!!! YAY!!!!!! YAY YAY YAY YAY!!!!!! Sister, I think about Crenshaw’s concept and theory of interectionality in my own life, Wendy Jane. I was raised black middle class and black middle income. Now I am an indigent woman being disabled with multiple physical and even other disabilities receiving my low, fixed income with my disability benefits. The very concept and theory of intersectionality are evident in my life. I seem to have a lot of all of the isms, sister and friend of mine, Wendy Jane. I’m a woman, a lesbian, disabled, poor now even though I grew up black middle class and black middle income, black. The only privilege that I have being college educated and I have Christian privilege with the dominance of Christianity which must cease with there being Christian supremacy and Christian hegemony. Wow, I can definitely see how intersectionality is at work in my life and with all of my identities, sister, but also I’m with you here, Wendy Jane, with the very same concerns you have that in looking at all of the other oppressed people and other oppression that blacks may be overlooked in that very process although I am also as well a very strong, ardent, and avid supporter and ally for other oppressed folks and in ending all other oppression. The only ism that I don’t have is that I am not a transgender person so I have also the privilege of being cis-gendered, friend and sister of mine, Wendy Jane. Thank you so much for your detailed thoughts and reflections here. I see that you really took time to consider all the identities you possess, and the varying layers of privilege and oppression attached to each one. I know you are dealing with a lot in your life, and I am always inspired by your strength, persistence, and most of all, the brilliant light you continue to shine on me and everyone around you–you deserve that light to come back to shine upon you ten-fold! YAY for you, Sherry! thank you for all you do for me with the support you show me here.